That brief spurt of sunshine earlier in the week had us all digging out the shorts and flip flops and lighter recipes for warmer times. The girls thought that it was summer. They plotted to have dinner at the table under the holly tree, spent time building a cabby house in the garden for sleeping in and requested – nay, demanded! – that I find their inflatable paddling pool. We may have resumed life in woolly tights and wellies, but we’re sticking with lighter food. 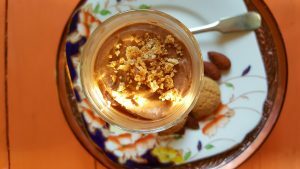 At the moment, dinner at the cottage is all about spinach and ricotta lasagne, big platters of salad, raw beetroot ‘slaws and these delicious Greek yoghurt chocolate pots. This is one of the recipes that I’ll be making for the Bulgaden/Martinstown Ladies’ Club cookery demo in Bulgaden Castle, near Kilmallock, Co Limerick (also the local nightclub spot; don’t get mixed up!) this Thursday, 30 March. It starts at 8pm, is a fiver in and we always have lots of fun, even if I’m spinning more plates than records. Everyone welcome! These are also good topped with chopped roast salted almonds or curls of dark chocolate. Original idea came from a recipe by Cheryl Sternman Rule, author of Yoghurt Culture. I’ve been playing with it a lot since I first made last summer and this is my current favourite variation. It’s a keeper. Melt the chocolate in a heatproof bowl set over a pan of simmering water, making sure the base of the bowl doesn’t touch the water. Slowly whisk the yoghurt into the chocolate. Once it is all blended, add the vanilla, salt and maple syrup to taste. Crumble a couple of amaretti into the bottom of each of six small glasses or ramekins. Divide the chocolate mixture between the glasses and chill to set. Sprinkle with some more crushed amaretti before serving, with any extra amaretti on the side.